This continues the analysis presented in the MicroData Not Ready For Primetime article previously published. Here, I break down the MicroData hierarchy into three levels so marketing professionals can review each category to see what value it can bring to future marketing, content and SEO initiatives. When you look at the type schema you see close to 300 metadata elements that can describe various entities (called Things here). There is a lot of specificity in a few categories such as Local Businesses, Civic Structures and Events. Two of these categories have real implications for local and mobile SEO because of the richness of the metadata. 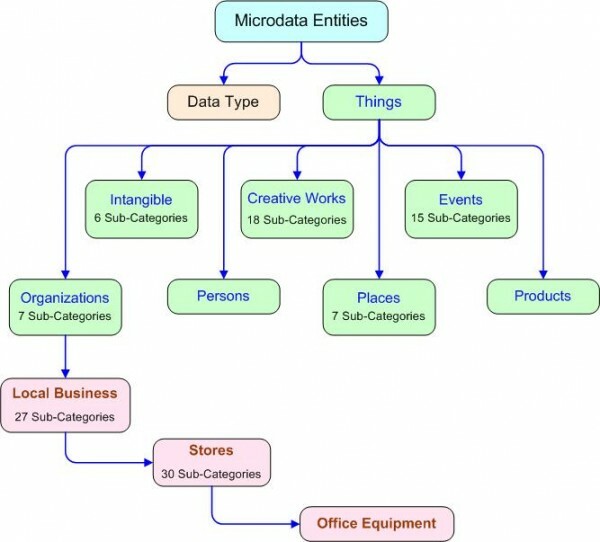 Below you see the high-level organizational taxonomy for the MicroData entities. It has up to five levels depending upon which category you are looking at. Here you see that three levels are associated with Local Business, while the Persons and Product groups have no subcategories. The high-level property elements for Things include Name, URL, Image and Description. These properties are applied to all of the following seven subcategories. Creative Work — Text and metadata include ratings, reviews and offers. Events — Metadata elements includes time, who, place and related events. Intangibles — This is dynamic metadata about quantities and values. Organizations — Metadata to include location, founders, employees and contact info. Persons — Metadata includes title, awards, affiliations, family relationships, personal information and contact information. Products — Metadata about brand, model, manufacturer and reviews. Let’s take a look at each of these seven categories in a little more detail to see what might be valuable to a B2B marketing executive. Not all will be useful; some will be pure media plays, while others will be B2C oriented. The properties available in the Creative Works category are metadata elements used to describe all the elements of a piece of creative work. This includes things like identifying headlines, the editor, genre and author. Many more properties are described at the creative works link above. To find out more please go to Search Engine Land to read the rest of the analysis.